The incredibly popular HEQ5 Pro GOTO mount and tripod but with the Rowan Engineering belt mod already fitted! Please note delivery times on the modded mounts is approx 2 - 3 days. Please contact us for more information. The computerized SkyScan hand controller. 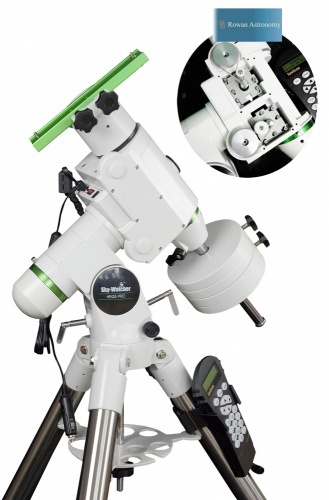 There is a pole-finder telescope supplied with the HEQ5 Mount that can be used for accurate polar alignment. This method of polar alignment is sufficient for virtually all visual use of the telescope. Pillar tripod support for HEQ5. Power Supply Unit (17AH) for EQ6 and HEQ5. A computer to control the telescope mount (e.g. Windows 2000/XP/Vista). AstroArt is a good commercial solution, because it can control multiple CCD cameras (e.g. for guiding and imaging) and it can be used for image stacking, processing, photometry, etc. Shoestring GPUSB auto-guider USB Connectivity Kit, through the computer's USB port. Shoestring GPINT-PT auto-guider Parallel Port Connectivity Kit, through the computer's Parallel Port.